I think this title is corny. Lol. It cracks me up that deep down, this title makes me somewhat cringe and giggle at the same time, hahaha. Enough about that! I have I always referred to this blazer as my blush blazer and the jeans, well, they are obviously distressed jeans (so popular right now! ), hence the title. I snagged mine from a consignment store for just $10… $10!!! Such a steal, I was ecstatic! I was thinking of how I personally wanted to style my jeans and decided to go the “unstructured” route. I tried a few tops that one would’ve instinctively pick to pair with these jeans but after a few futile, dissatisfying attempts, I thought well maybe I can make this loose, asymmetrical Asos top and an equally loose blazer work with a really casual pair of jeans…. I think I just did. J Turned out to be a good day after all. Thank you so much for reading, and if you haven’t yet, please check out my Instagram @my_sinina J and see you on my next post! Poppin tags! Making Macklemore proud ;) Love the look! thanks Shermena hahaha , I hope so! You look so pretty! I love the color of your jacket! Love this color combo! And the shoes are awesome! thanks for the love Courtney! Yeah that blazer was such a steal, so lucky!! And thanks for commenting!! I'm glad I'm following you on IG, you have such great outfits and you're gorg! thanks emma!! youre too sweet! hahaha OMG this made me laugh, Phoebe! thanks for stopping by! Beautiful outfit, I love how the pink and yellow look against the blue of your jeans! yes, you do!thank you Doori! That bag is gorgeous!! Love your makeup too! 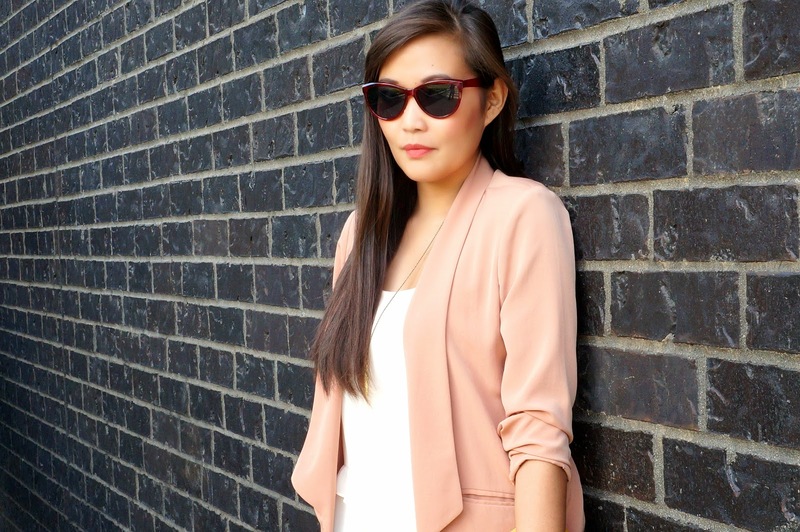 The blush pink blazer is so gorgeous! I love how you wore it with the flowy blouse and neutral heels. you look super stunning and love your clutch ! This is such a gorgeous look! I never think to shop at Asos because I am so unfamiliar with their sizing and am afraid it would take some trial and error to get it down, but they always have great pieces at great prices. Very cool scenery choice, too!